TTC has provided on the job training for centre lead operations to tug masters and deep sea pilots on Safeen’s request in Khalifa Port. This is a new product on TTC’s long training list. Joint Pilot Tug Master training is more and more requested by various ports in the world, to increase port safety and efficiency. Efficient team work between Pilot and Tug Masters is therefore one of the key training programmes of TTC and as such also recognized by Safeen as of key importance for the Port. Our dedicated staff provided on the job training to prepare the local tug masters and the deep sea pilots to assist cape size bulkers on centre lead operations. The cape size bulkers will start calling Khalifa port as from March 2019 and require a different approach of assisting as currently is being done in Khalifa Port. During the last months, ten tug masters and ten deep sea pilots with operational skills were upgraded and retrained to be familiarized with the towing method they will use for the new operations. At TTC, we believe that improved safety, efficiency and profitability are achieved when everybody properly understands the complete picture. When we train tug masters in vessel operation, we leave them with a firm appreciation of how their actions impact others around them. We also use our in-depth knowledge of tug operation to provide clients with the best possible advice on tug design, harbour or jetty layout and nautical processes. One of the core focus areas within TTC’s training and consultancy projects, is to raise standards of nautical service providers through improved collaboration. 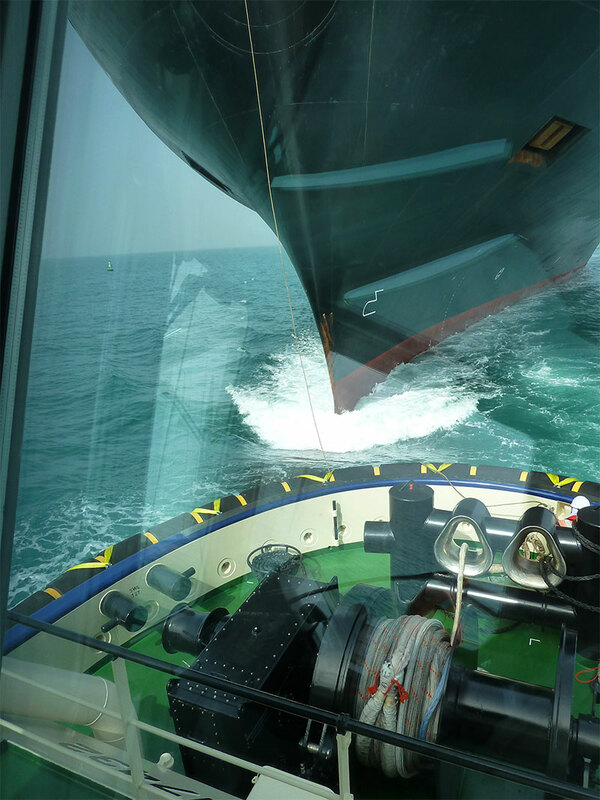 The range of maritime and quayside-support services include vessel assistance, navigational support, inspections and shipping maintenance at Abu Dhabi’s ports and beyond. From floating offshore oil & gas infrastructure to container ships, all can be guided safely thanks to in-depth knowledge of Abu Dhabi ports’ harbour characteristics. The tug fleet is advanced and the crew is skilled. The pilots working at Safeen are skilled and experienced. They work closely with their well trained colleagues from towage.